Surprisingly, the westslope cutthroat trout is the only native trout species in the rivers and streams of western Montana. These pretty fish are also found in many pristine high country lakes and ponds. The westslope cutthroat trout is a beautiful fish that displays brilliant spawning colors. 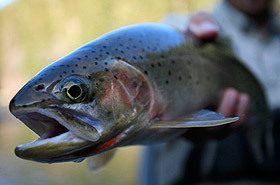 It can be identified as a cutthroat trout by the iconic red to orange slashes under the lower jaw. To distinguish westslope cutthroat trout from other cutthroat species, you can look for more small spots by the tail and none by the pectoral fin and a more silvery or greenish color. This “home town boy” sometimes gets a bad rap as not being as smart as his near cousin, the successfully introduced rainbow trout. Smart is not a word that aptly defines behavior of any trout and many an angler has been duped or shaken off by a big old cuttie. For the sake of argument, cutthroat trout are quick to take a dry fly, but what’s wrong with a fish that refuses your first bad drift then rewards you with an eat when you get the presentation right? These westslope cutthroat trout spawn in the spring, in the same tributaries and spawning gravel as rainbows, so a lot of fish that look like one or the other are hybrid fish, called “cutt-bows.” Expect to catch cutthroats on all our rivers and streams in the 10”-16” range, with some 18” fish, particularly in the lower Clark Fork. They typically are going to be a little smaller than rainbows in the same stretches.